The name itself says it all: we are speaking about a Guitar Compressor, i.e. a compressor that was designed especially for the guitar. In other terms, the other compressors that you may encounter were never designed for this special usage! As a matter of fact, no other compressor takes into account the very specific dynamics of a guitar note: they compress, full point, and you have to like the result or not. What are the compressors that you can buy ? Either cheap circuits stuffed into a pedal format, either costly studio units that are really cumbersome and costly solutions for what a guitarist needs. The quest is over: the Rockman Guitar Compressor is unique, and really meets a guitarist's requirements, without concession. Tom Scholz has spent a lot of time on the compression topic. As explained in Rockman - The concept, compression is a key feature of the Rockman sound, that allows getting natural sounding clean sounds and distortions with a very long sustain. Every Rockman amp simulator has a built-in input compressor, from the first Rockman headphone amp, in 1982, to the AGP and the UDG, in 1993: it was only natural to expend the basic circuit present in every item into a dedicated unit: that's how the Guitar Compressor was created. The funny fact is that, since there is already a compressor in every Rockman item, the Rockman Guitar Compressor is perfectly useless if you use Rockman gear! As a matter of fact, the Guitar Compressor was designed as an add-on for people who play with a classic guitar amp - but want this Rockman compression sound. The Rockman compression circuit being a key part of the Rockman sound, it is useful to take a close look at its principle. The following charts are over-simplified schematics that every one can understand, and will help you understanding why this circuit is different, and eventually to understand what the famous "Lead Leveller" is all about! The common compressors are limiters or sustainors, but none of them can perform correctly the two functions. The Rockman compressors can do it. It took several years before finding the perfect circuit, the challenge being to handle the transition between the two parts of the note - the strong peak then the slow decay. Let's review step by step what the rationale was, and how SR&D started from the basic compressor of the Rockman headphone amps and finally developed the Rockman Guitar Compressor and its Lead-Leveller circuit. That's a gain stage, based on an OpAmp and two resistors. All you need to know is that the gain of such a circuit is equal to 1+R2/R1. The smaller R1 is, the larger the gain is. The larger R1 is, the larger the gain is. A compressor is, basically, a gain stage with a variable gain. A circuit that has a high gain with low signals, and a low gain with high signals. Let's add a Field Effect Transistor (FET) to R1. If we apply a negative voltage Vg to the gate of this FET, its resistance Rt will increase, and the gain of the OpAmp will decrease. This circuit is called a Voltage Control Amplifier (VCA). That's a nice beginning for a compressor: if we find a way to generate the proper negative control voltage, our compressor will automatically adjust its gain as expected! This diagram shows what a basic diode can do with an audio signal: only one half of the signal goes through, and the positive half is cleared. That's not a control voltage yet, cause we still have those half waves, but we are getting closer to our objective: generate a negative direct current, proportionally to the strength of the audio signal. In order to clear these negative oscillations, we add a capacitor right after the diode. A capacitor has a natural inertia, and cannot follow the rapid voltage changes of the half-waves. The result is a continuous, constant voltage, which is 1) negative and 2) proportional to the strength of the audio signal. We have our control voltage for the FET of the compressor! 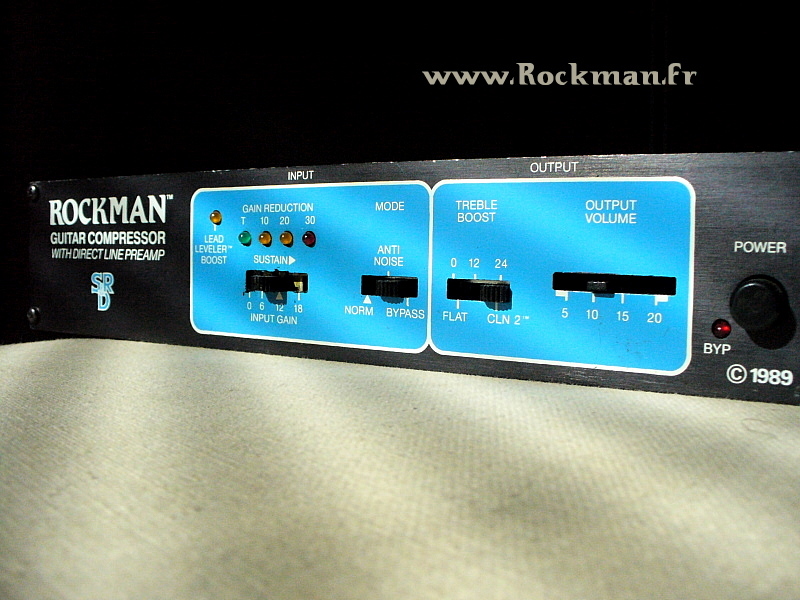 What we have here is very close to the simple compressor of the Rockman headphone amps. The diode and the capacitor are a feedback loop that sends a strong negative voltage when the input signal is strong, thus reducing the gain, and a low negative voltage when the audio signal is low, thus raising the gain. That's what we wanted to build! The common compressor stompboxes are all based on similar, simple circuits. They work, with more or less interesting results. The problem with these simple circuits is the fixed, constant release time. The associated problems are usually unpleasant pumping effects: the circuit cannot react the way it should, and some notes are loud when they shouldn't, or weak when they should be raised. In Tom Scholz's patent US 4,627,094, we can read that the release issue was not solved yet: a soft note following a loud note wouldn't be processed correctly. The problem with the guitar, and the reason why the other compressors cannot handle it correctly, is that a guitar note is made of a very strong peak followed by a long decay. The diagram shows the reaction of the compressor to a signal pulse: instant attack, constant signal, instant decay. Following the fast attack is easy, but the classic compressors have a constant release rate (blue curve) that doesn't match the guitar constraint: a fast release first, then a slow release. The objective is to have a two-steps release, as depicted on the green curve: that's what SR&D developed for the Sustainor, and that's what makes the Rockman Guitar Compressor different. The next step was to reduce again the fast release step for the guitarists who use ultra-fast tapping techniques: that's the red curve - the Lead-Leveller. In the Rockman Sustainor's compressor, the capacitor is discharged via a series of 3 diodes and a LED. This trick allows getting the green curve, with a fast initial release rate followed by a slower second step. Note that this fast initial decay is also necessary to provide the long sustain that we expect from a compressor: that's another key quality of the Rockman compressor. This series of four diodes was the answer of SR&D to the transition between a limiter and a sustainor circuit, and this solution can be found only in Rockman compressors. The Lead-Leveller is a very subtle change in the circuit: the LED is just bypassed, in order to have an initial decay which is faster again. No need for a Double-IC in the Rockman Guitar Compressor: this J-FET switch was integrated in the design and didn't require this cumbersome modification. The Lead-Leveller is simply activated by a footswitch that bypasses the LED of the circuit. A few words about the other features of the Rockman Guitar Compressor: if you look at the front plate, you will see two slider switches. One of them is used to bypass the unit, and also to activate a noise reduction circuit - a sort of simplified Smart Gate integrated in the compression circuit. This feature is extremely useful when the compressor is followed by a hi-gain saturation: all the compressors generate some noise (since they raise their gain when the signal is low), and this noise reductor avoids this trouble. The Guitar Compressor was completed by a two positions Treble Booster: at the maximum setting, the Guitar Compressor reproduces the classic Rockman CLN2 sound. That's why the Guitar Compressor can be considered not only as a compressor, but also as a substitute to the clean channels of the Rockman Sustainor. The Guitar Compressor is honestly useless if you have a Rockman Sustainor: in a DI approach, it won't generate any sound that a Sustainor cannot create. If you don't have a Sustainor but have a Rockman Distortion Generator, the Guitar Compressor is the perfect add-on to your rig: one module for the distortions, and one module for the clean sounds. As a matter of fact, the Guitar Compressor was really designed to be used with a guitar amp. I had really given up using compressors years ago, and didn't want to use one again: I was tired of all this noise, pumping, dynamics loss, etc... that the other compressors do. Then I purchased a Guitar Compressor, and completely changed my opinion about compressors: this unit is amazing, and really enhances the sound of the guitar without messing it up. Limitations? No, the unit is perfect as is! The Guitar Compressor is fairly rare: 2350 only were made, and it is pretty hard to find one. The price on the market is accordingly high, but it's only fair if you consider the quality of the unit. A unique device, actually the only compressor designed specifically for the guitar. If you need a compressor, this is the unit to buy and keep.